The exhibition presents different research and urban initiatives. Which are they and why did you select them? In Basel, I chose four research projects and four initiatives, just the most interesting ones for me, especially those from Montenegro and Albania. Both are hardly known but extremely important in their countries and have a very similar story: in the 90s, young students started these initiatives after finishing their studies and now they are involved in planning at all levels. They represent success stories and, quite astonishingly for me, they had never heard about each other, even though the distance from Kotor (Montenegro) to Tirana is approximately 200 km. Again, it's also a matter of bringing more public attention to what they do. Anyway, this is a small part of what's going on because the limited space forces you to select and to show what you can show. We will extend this part in further presentations: in October, Balkanology is scheduled at the Architekturzentrum in Vienna and will also comprise research on Bucharest, on Sofia, on Pula and on New Belgrade. Can we speak about "a Balkan city"? Well, it is difficult to speak about "the Balkan city." Look, for example, at Bucharest, Romania. This is such a typical European city! Of course, they had the problem of forty years of socialist rule, but they have their own university for architecture and urban planning that was founded in 1892. They have a really long tradition and they are going to start improving it again. On the contrary, Pristina was a little province city before becoming the capital of a newly invented state. It is impossible to compare, let's say, Bucharest with Pristina: their political and social circumstances are completely different. At the same time, all these cities are in Europe, inhabited by European citizens whose cultural value system is extremely European. The kind of non-regulated urbanism that we described before is not uncommon in South-eastern Europe: all of Athens, Greece is built that way. If you talk about planning in Tirana or Pristina etcetera, you have to look at Athens: they do it by "post-regulation," by legalisation and improvement of the urban structure after it has been built. This is completely normal in Greece. I think it's better to look at how they do it than to bring German planning principles to Kosovo which are unlikely to be adopted successfully. Regulation is a political and social thing too, so every society has to find its own way in this. Moreover, this kind of urbanism has nothing to do with what's happening in non-European countries. You cannot compare it with favelas, barrios... or what we know from India, China or whatever. This is a completely different way of urban development. So, turbo-urbanism may be prototypical for this area of Europe but then, from case to case, there are differences you have to deal with. What difference can we recognise between urban development in countries that experienced transition, let's say in Eastern Europe, and countries like the former Yugoslavia or Kosovo, which, in addition to the collapse of the socialist system, also suffered war? The countries most affected by the Balkan wars - like Bosnia-Herzegovina - suffered the most, not only because of war damages, but also because of all the political problems that came out of that: politically everything was blocked and they had a lot of migration. Actually, all cities in the former Yugoslavia have been highly affected by migrant fluxes because of wars, by people moving from the rural areas and by the many refugees sent back by Western countries. These dynamics had a huge impact on urban development and represent a very big difference from what happened to cities that didn't suffer either war damages or such huge migrations. Introducing Balkanology, you speak about "a new kind of urban form...whose specific characters result from a new intermeshing of spaces through visual worlds communicated by the media, migratory movements and cash flows." Can you give us some examples? First, there is a strong connection at the financial level. Especially in the case of economically weak states like Albania, Kosovo, or Bosnia-Herzegovina, a high percentage of the population is not inside the country, but is living abroad and sending money back: 50 % of Kosovo household income relies on migrant workers remittances. All the houses being built are mostly built with the money from migrant workers, money earned in Western Europe. Even if most people don't realise it, what happened in the Balkans is actually very much connected to what happens in Western countries. 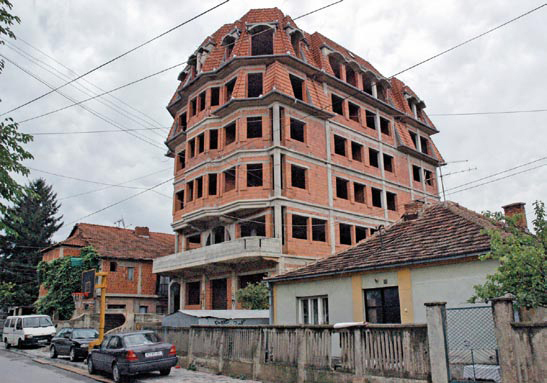 Second, when people in the Balkans build houses, they build really huge houses - that's why this urban form has nothing to do with slums or barrios. Without architects, they solve the problem of how the house should look simply by copying things they've seen in media or around them. Ask them and they'll tell you,"I liked those columns, I want a garden like that." They looked at lifestyle magazines or took inspiration from their neighbours' place, from a TV show or soap-opera. It has nothing to do with local tradition because being traditional means being old-fashioned. At the same time, they also try to avoid what we, as architects, consider modern because this kind of architectural language mostly reminds them of the socialist period they have overcome. This is the reason that you have these kinds of, let's say,"fantastic" buildings. You mentioned migrant workers as the main investors in this building market. Are there other international investors? In a specific post-war situation, the arena is mostly local because the market is considered unsafe and there are very few international investors. Afterwards, big investors try to invade development in the cities. This is what is happening for example in Zagreb or in Sofia where Russian investors are buying out the inner city, or in Montenegro where they tried to buy out the Bay of Kotor. This is highly problematic too and it's very important that local architects and planners convince politicians that these investments should be done in a proper way which fits city development. If "Pristina is everywhere," can we look at the urban transformations in South-eastern Europe, somehow, as a perspective on European urban development? Well, at first I would say no. It is a very provocative sight, but in highly-regulated countries such as Germany, for example, phenomena such as those in Pristina could not happen. But you can take turbo-urbanism as an example of what happens if deregulation takes place. It shows to architects, politicians, also officials in Switzerland and in Germany that yes, you can deregulate, but at a certain point it turns out like Pristina. After decades of experience in these countries, I think regulation and planning are good things and I am quite proud of the system in Germany. I don't complain about it as much as my colleagues. But "Pristina is everywhere" also means that a big part of the population of these countries is not in their country: this urban development is highly triggered by migrant workers and therefore this problem also concerns the host countries like Germany. Finally,"Pristina is everywhere" because we can generally say that these kinds of phenomena always appear in post-war situations: structurally, you also find this in Kabul.